In the early 70s, Micael Priest, working through Directions Company, also did work in San Antonio and KEXL radio which was the happening station at the time. Here is the poster for the George Carlin with Kenny Loggins/Jim Messina at Laurie Auditorium. It was weird billing but the show was packed. Laurie was a great venue. Another killer show was Fleetwood Mac with Pure Prairie League at the Austin Municipal Auditorium. 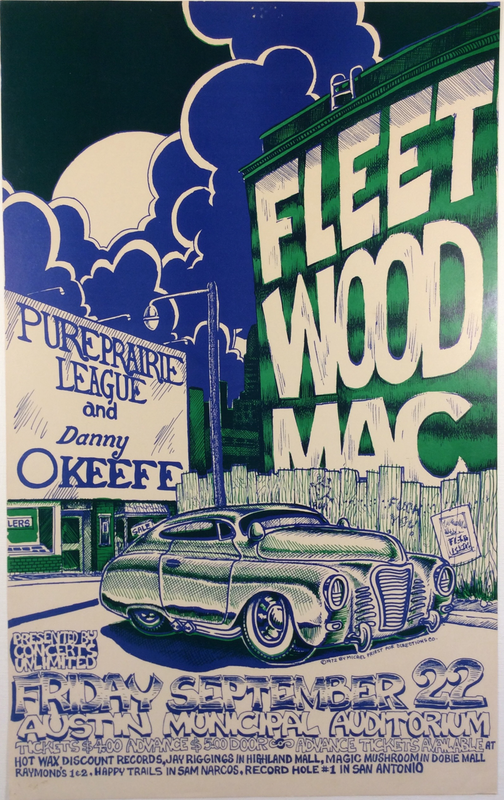 Both of these posters represent some of the best of the early 2 and 3 color posters produced of the period. This was a Concerts Unlimited show. I helped work sound and provided equipment from the Electric Machine on San Pedro and Holloway House of Music in Wonderland Mall. As I became a sound engineer doing live shows at the old Bijou on San Pedro. Jerry Jeff, Willis Allen Ramsey, Ray Wylie and on then I moved up the chain and began doing audio for Willie. Show Co and Montrose sound were trying for a contract to provide sound reinforcement back then. I lucked out just being the guy that ran the board or kept Trigger tuned and hid in my car or hotel room. Looking for others from back then. Eric Van Cleave epvancleave@sbcglobal.net Hanoin at KEXL at nights with Allen Grimm..Woa.. 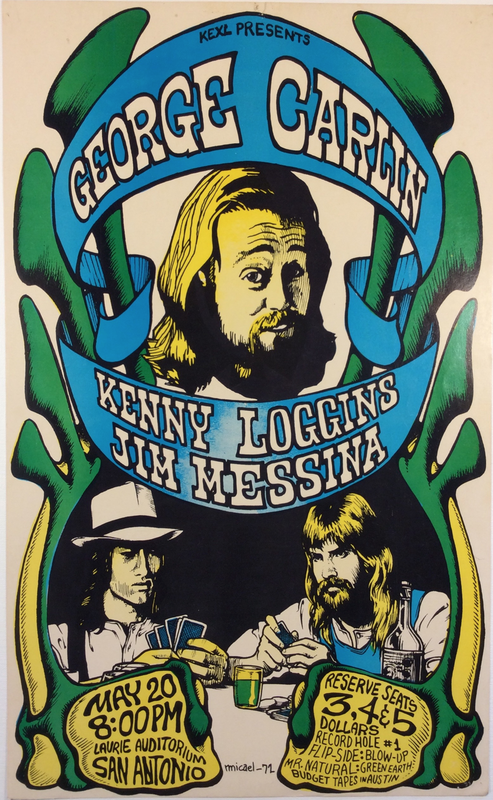 The show with George and Loggins and Messina was fun just sitting out in the audience and then back stage for a while. The audio was good and the small intimate show was 100%. Spent many years doing sound back then in SA and Austin. a old friend that used to hang out back stage at our shows when we did Willie ended up running the Austin Music Hall then when the tax man came Willie gave him the Backyard. One night Bobbie came and sat at the sound board and asked me to consider staying with the family to do sound cuz as she put it.."You make us all sound so good". Two nights later I told Willie before a show at John T's it was time to move on and I went to work for Datapoint in SA. I thought computers were going to be a better lifestyle cuz the nightlife and partys temptation and deceit the order of the day...I had too many Bloody Mary mornins. Oftem wonder what it would have been like but friends with Willie and Bee and his wife back then were fun times. Got a great story about a show at Sunken Gardens and Willie having to wrangle Daryl Royal back from driving off drunk and mad cuz I liked talking to his his daughter while we ate BBQ backstage. Daryl gets pissed and trys to drive off drunk in his Caddy convertable until Willie jumped in and stopped him...what a hoot.